Yay! Made it through my nerves at @AlterConf. Everyone was amazing! A brief recap before I go fall down from all the tired of today. AlterConf Sessions was awesome. Though I am terrified of public speaking, I did the thing and it was good. If I seemed a bit out of it by the end of the day, I apologize. I’m an introvert and that much socializing can be draining for me. Also speaking solo in front of a crowd gives me a -10 modifer to Charisma. Everyone’s talks were amazing, and I felt so inspired, and learned a lot from my fellow speakers today. 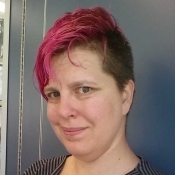 Thank you again to Ashe Dryden for creating AlterConf Sessions, for being so welcoming, inclusive and along with the volunteers and AlterConf ambassadors doing such a phenomenal job today. Thoughtworks was a nice space and it felt …comfy. It wasn’t really small, but it wasn’t a huge, intimidating auditorium. The audience was great, loads of wonderful questions and I learned so, so much today. A lot of people asked where to get an #INeedDiverseGames shirt; you can go to: http://ineeddiversegames.spreadshirt.com any and all proceeds go back out to helping folks attend conferences, etc. Everyone’s talks were recorded,and will be captioned, etc… I’ll update once they are online. Thank you again to everyone who supported, tweeted, retweeted and helped make today possible. Updated – I’m on two Wizard World Chicago Panels!